You don’t have to have been following this blog for long to know I write quite often about feminism. It’s not even feminism so much as it’s gender equality, so I guess you could call it femenimism, really. Boys shouldn’t be shamed for crying like girls shouldn’t be shamed for farting. Men should be celebrated for choosing to be stay-at-home-dads just like women should be celebrated for choosing to run for prime minister. I worry about my son facing the limitations society places on masculinity as much as I worry about my daughter facing the mixed messages of her femininity, but I write more about female equality because it’s at the heart of the sisterhood mentality we’ve got going on here. Modern society is telling us – be a strong woman, know strong women, raise strong women – and I jump on that bandwagon because: Yes! Strong women! 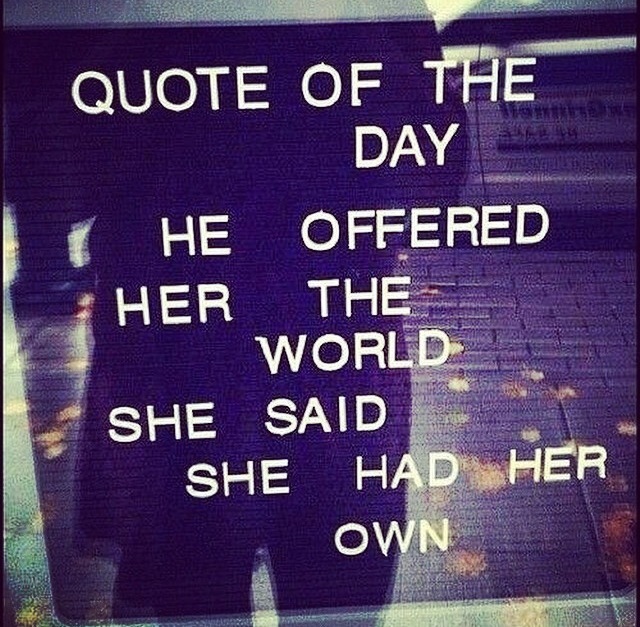 Own your own stories, sisters! Fly your own planes! But I’d be lying if I said my “strength” wasn’t still confused as it tried to find a place within my modern-day marriage (which isn’t even a marriage, by the way — I just say that because it’s an easier description of our relationship than “defacto partnership arrangement”, which is all a bit of a mouthful, isn’t it?). We are living in new times. There is a new dance that goes on between men and women in relationships. Gender resides on a scale within each of us. There are strong movements encouraging men to embrace their sensitivity (feminine side) just like there are strong movements encouraging women to embrace their opinions, independence and strength (masculine side). What we’re facing now is the challenge of striking a balance where these masculine and feminine sides to both of us meet in a mutually supportive way – a way that allows us to offer our gifts to each other without taking away each person’s identity in expressing who and how they are. As a woman, I struggle with the dance between strength and softness. It creates problems in my relationship because by being ‘strong’ it takes away Joel’s ability to be strong for me, which is something that brings him joy and a sense of identity. It’s inbuilt in our gender roles that men take care of their women, though we are being told: Women! Take care of yourselves! So I get confused about how to take care of myself, while also letting a man take care of me. I think, most importantly, it’s essential we redefine what it means for a woman to be strong. Because when we say to our little girls, Be STRONG, my darling. Stay STRONG, I often think — Hang on, why do we have to tell our girls to be strong? Isn’t it okay to be weak? Aren’t we supposed to embrace sensitivity, to embrace our softness and fragility? Softness and sensitivity are gifts just as much as adventurousness and boldness are. And then I think, when we say to our girls BE STRONG, it is most important we clarify what it MEANS to be strong. It is most important we are praising the right things when we cheer that our girls have been so strong. Strength is not an impenetrable, hard outer shell. Strength is not the absence of softness. In fact, strength and weakness are not even opposites. To me, strength is not facing the fear and doing it anyway. It is not jumping off the cliff because that’s what all the other “strong people” do. Strength is staying true to yourself at all times, at all costs, no matter what the response might be. It’s when our girls (and boys) stand up and say, “I don’t want to jump of that cliff even though everyone else is and I will get teased for not joining in.” But it’s ALSO when they stand up and say, “I WANT to jump off that cliff even though other people think it’s dumb and I will probably get teased for it.” You see, strength is VERY specific and VERY personal — it differs from person to person depending on what their deepest wisdom is telling them. What is the same for ALL strength though is listening to yourself and doing as you say IN SPITE OF EVERYTHING ELSE. Strength is the combination of two of my favourite quotes: Know Thyself and To Thine Own Self Be True. So, when we say to our girls, Be Strong, what we are really saying is, Be You. If you are feeling fragile, and afraid, and lost and insecure BE THOSE THINGS WHOLLY AND OPENLY AND HONESTLY even if you’re not sure how it will be received — even if you worry you’ll be called needy, or oversensitive, or flaky. If you are feeling ambitious and head strong and hungry for it all BE THOSE THINGS WHOLLY AND OPENLY AND HONESTLY even if you’re not sure how it will be received — even if you worry you’ll be called bitchy, or competitive, or unladylike. This is true strength, and this is why weakness, softness, and sensitivity are NOT opposites of strength. FAKE is the opposite of strength. No bravado, please. Give me Real. Strength is: Own Your Story, Sister and Hold Your Head High. Because that is the thing which gives us true power, unshakable power: Being our whole selves and trusting that we are okay in this world exactly as we come, exactly as we are. So how then, does this fit into our modern-day relationships? I saw this quote a while back and I thought: Yes. That is the beauty and the hard of it. The thing is that every girl can make her own world. Every girl should make her own world, because every girl is strong enough to. But without anybody else in it, it becomes a very lonely place. And so what must be painted on a sign and wedged into the earth at the front of each of our worlds is this: VISITORS WELCOMED AND VISITORS CHERISHED. The welcoming and cherishing of our visitors looks a lot like opening the front door, putting on a pot of tea and making space for them in our homes. Their own coffee cups. Their own towels. Their own wardrobe space. Their own toothbrushes next to ours. They know I can make my own. I know I can make my own. Everyone knows everyone can make their own. Caring and being cared for are acts of LOVE not acts of STRENGTH. And so, by making each other cups of tea, switching the maker and the makee depending on whom is visiting whom’s world, we learn how to mutually care for one another, offering each other these small gifts of love, while keeping our own worlds in tact.